As cyber-punk manga goes this is probably the most well-known and highly-regarded of them. Influenced by a variety of sources, and in turn providing inspiration for many later artists, “The Ghost in the Shell” is a work that has become truly embedded in the public consciousness (whether people know it or not). The manga focuses on a future society in which the internet and cyberisation have blurred the lines between humans and robots, and the real world and the online world. Our protagonists are a special ops team whose purpose is to stop high-level hackers and other cyber-criminals. 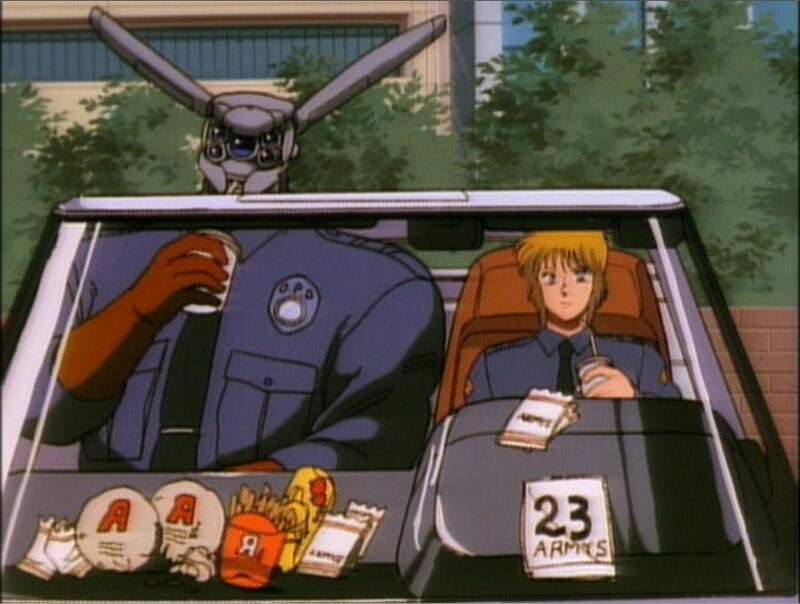 Led by their charismatic leader Motoko Kusanagi, under the supervision of Aramaki, Section 9 is intended to operate somewhat independently of regular law enforcement. They are joined by other team members, Bato, Ishikawa, and even, unusually, a fully human member Togusa. Each chapter of the manga follows the team on a separate action-packed mission and there is clearly a love of cop dramas and science-fiction throughout. Shirow is also dedicated to details and his entertaining footnotes are a pleasant addition to the narrative. Whether it is explaining his thoughts on the political set-up of Japan, or simply to tell you that he quite likes porridge, it is an endearing part of the work that helps you feel closer to the author and understand their reasoning behind certain story decisions. The world of “The Ghost in the Shell” contains a fantastic level of details, whether it is government ministers who reappear, or the explanation of how cyberisation techniques work, and all of this helps create a reality to this unfamiliar future. There is also a sense of fun that is lacking in later iterations of the franchise, with characters often appearing in more cartoonish form to make quips. The art work is great throughout, with incredible cities, crowded streets and more. They are drawings that it is fun to pick over and spot little additions or simply marvel at what you are seeing. Shirow keeps everything hi-tempo, and states a dislike for exposition when it can be avoided. You will often see characters being active while explaining which helps keep things interesting while giving huge amounts of information at the same time. And every moment of drama is captured perfectly, whether helicopters landing, or characters running, leaping or fighting. The stories all work well in the episodic format as well as a longer story involving the Puppeteer (that was used in the anime film adaptation). A must-read for fans of dystopian science-fiction and action-packed comic books. Based on the manga by Masamune Shirow, Appleseed takes place in a future world ravaged by a Third World War. Humanity has constructed a utopian society called Olympus, ruled over by computers and bioroids (an elite of cybernetic individuals). Our protagonists are SWAT-team members Deunan Knute and Briareos, who has a fully cybernetic body. When life in Olympus is threatened by a terrorist plot led by humans who have become disaffected living under the rule of robots, Deunan and Briareos must work to stop it. We are thrown straight into the action with the film beginning with a suicide and a hostage situation that SWAT are dealing with. Throughout the script is incredibly efficient. Within a run-time of a little over sixty minutes it manages to establish the world, the idea of Olympus, bioroids and GAIA (the computer system that controls the city), set up several themes and ideas, and develop its protagonists. We discover that Deunan and Briarios are romantically involved as well as being partners, and while the film rarely dwells on this it is nice that they did not choose to omit complexity despite being a short movie. The film is much more humorous than later installments in the franchise, perhaps heavily influenced by the decade in which it was released. You can certainly sense the 1980’s buddy-cop vibe. It is hard not to draw the comparison with those films, which use a lot of the same material and expand upon Shirows creation. Writer and director Kazuyoshi Katayama does a good job in crafting an enjoyable science-fiction action film. Although the animation has dated a little it is still great to see this more light-hearted interpretation of the characters. The film deals with a number of issues relating to the interplay between robots and humans in the future, something that with each passing decade becomes more and more pertinent. While most humans have learned to accept their roles in a world with superior beings, many still insist on fighting for their individuality, or belief in human dominance. There is a sub-plot involving a discussion of the rights of bioroids and also a hint towards possible psychological issues involved with an increasingly technocratic society, such as the characters feeling they are trapped in a prison, rather than having any real control over their lives. Overall, this is a great watch for Appleseed fans as it shows the first attempt to bring the characters to the screen and also features many elements that will be recognizable from later films.